Design a Mezuzah is the brainchild of Rafi Bernstein, an Israeli-born artist, fabricator, woodworker and graphic designer living in New York City. 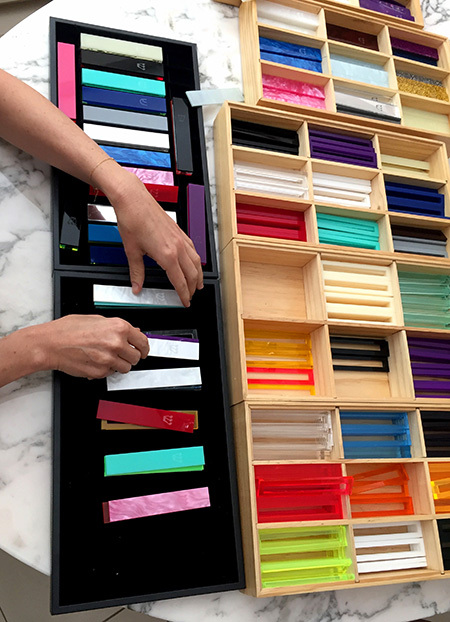 While looking through the acrylic divider at a salad bar, he hit upon the idea to truly integrate the customer into the mezuzah-making process. Why not give the consumer the option to customize a mezuzah case that would perfectly match their own personal taste? With that as the seed of the idea, Rafi designed a three layer system where by each customer can choose a face and two layers of acrylic from a variety of colors which can then be welded together for a seamless final product that fits perfectly into the décor of one’s home or office. Although this product has enjoyed great success at holiday boutiques in the tri-state area and through word of mouth, a website which enables the customer to spend as much time as s/he wants playing with the various mezuzah permutations in the comfort of his or her own home and on their own schedule will make the process easier and more accessible. For large quantities, these mezuzot can be further customized with a monogram, logo or other special name or word. If you would like to discuss a special bulk order please use the contact form to discuss other options and pricing. All rights reserved © 2019 Impression Set, LLC.